The Skyway was a gondola style ride that connected Fantasyland and Tomorrowland at Disneyland, the Magic Kingdom at Disney World, and at Tokyo Disneyland. This one-way ride allowed passengers to board at either the Fantasyland station or the Tomorrowland station and fly above the park as they could watch the crowds mill through the park. Since this was a one-way ride, if you left a stroller or other members of your party at the station you boarded at you would have to walk back through the park or stand in line to ride the Skyway back to your original station. The Skyway had a few unique stories behind it; particularly the Skyway at Disneyland. 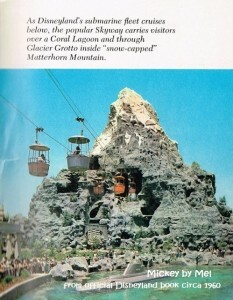 This Skyway ride went right through the Matterhorn! 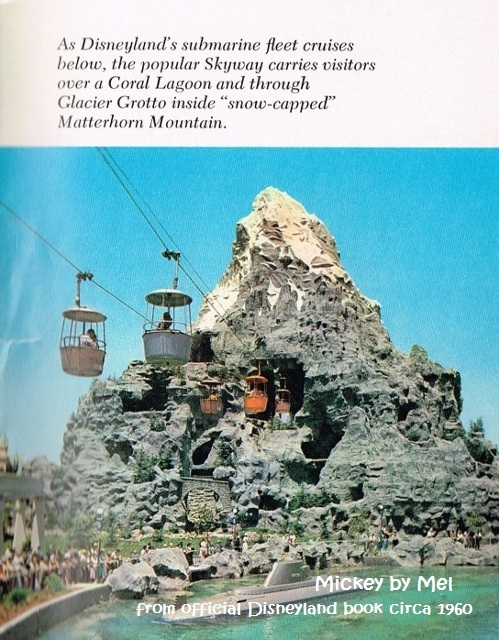 The Matterhorn was designed and built after the Skyway was in place so the ride was built right around the Skyway without ever causing a closure to the Skyway! Sadly all three Skyways have shuttered their doors. The Disneyland version was the first to close in 1994. It was followed by the Tokyo Disneyland version which closed in 1998. And then the Magic Kingdom followed suit in 1999. In the Magic Kingdom, the towers where you would load into the ride remained around for several years. The Tomorrowland station was taken down first but not until 2009, 10 years after the last ride! The Fantasyland station had been used as Fantasyland stroller parking since the closure of the ride. As of my last visit in July, the demolition of the station had finally taken place and it is now behind a temporary wall as Disney makes way for new Fantasyland restrooms. It is a rather sad ending to the tale of a classic Disney ride. Do you remember the Skyway? Share your memories and stories with me! I am a sentimental old sap who loves Disney the way it was (don’t worry I eventually come around for most things). But the park of my childhood always puts a smile on my face – how about you? This took me back. I do remember the skyway and rode it everytime we went. I too often wondered why it closed. But I do have to admit that I was a little nervous evry time I rode it! I always rode it too! For a long time I hoped that they would bring it back. I think it would make me more nervous as an adult than it ever did as a kid! I loved the Skyway when I was a kid. Not sure why, it really wasn’t any thrills for sure, but there was just this great fun about sitting back and enjoying the ride. I guess because some of the bigger thrill rides seem so short. Once you finally make it to the front of the line and get on, it is time to get off. I was always a big People Mover fan too. Same principals I guess, just something to sit back and enjoy the ride. Thanks for taking me back!